Do you really think it is possible to make a fortune...in a rainy country like Scotland? Why don’t you ask Charles Macintosh! This Scottish chemist and inventor born in 1766 discovered a new material which was waterproof. There had been several attempts in the past to protect people from the rain, notably by Thomas Hancock, but Macintosh was the one who found the perfect solution by combining rubber with garments. He patented his wonderful invention in 1823 and in the following years he started the production of sheets and coats. It is in 1834 that he founded his own waterproofing company in Glasgow but he was not immediately successful because the tailors were not enclined to work with this cloth. It was indeed heavy and uncomfortable to wear. Even if it was rather rare on the rainy British Isles, the cloth had the unfortunate tendency of melting in hot weather. This pushed him to move to Manchester in 1840 where he could further develop the material. After his death in 1843 the company continued to make waterproof clothing throughout the nineteenth and twentieth centuries. Dunlop Rubber took over the company in 1925 and carried on Macintosh’s tradition. Nowadays waterproof raincoats are referred to as Mackintoshes, usually written with a ‘k’. It is a firmly established global brand that combines updated technology with traditional techniques to create the modern-day ‘Mac’. The Dunlop Rubber company has also collabarated with famous fashion houses like Gucci, Hermès and Vuitton, which proves the high standing of the coats. They are now sold almost all over the world and are particularly popular in Japan. 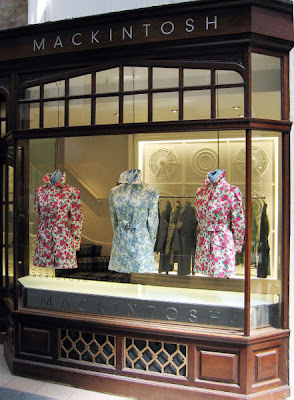 If you are interested in buying a Mackintosh, they are available for women and men in different colours and patterns and adapted to your size. But the high price-a trifling 500£-might dissuade you from acquiring one! Nevertheless the Mackintosh would certainly be a good investment in our rainy Belgium and even more so in these hard times.